San Marcos, TX brings new life to its city website with a fresh design, focused navigation, and many new interactive features. The website is easily managed by staff members using a powerful government CMS created by Vision Internet - The Government Website Experts. Our goal in developing the website is to improve customer service and government transparency. The City of San Marcos website at http://www.sanmarcostx.gov has a new look and an easier system for users to access key services and information. The new website went live May 9. The new website provides multiple points of access to information from the home page, such as online bill payments, jobs, community information, departments, news, calendars, events and contacts. City staff will be demonstrating the new website to community gatherings and organizations in the coming weeks. Staff provided a sneak preview of the site in late April with Open San Marcos and demonstrated the site at the May 1 City Council meeting. Community feedback has contributed significantly to the development of the site. 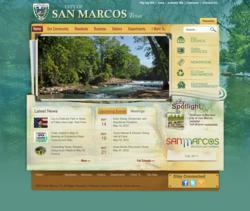 The City of San Marcos started its website in-house in 1995. This is the first major overhaul and redesign since its inception. The staff team worked with Vision Internet, a nationally recognized website developer for municipal governments, to build and design the site and provide a new content management system. Vision Internet is the leader in government website development with over 400 clients across the US and Canada. For over 16 years, Vision Internet has been creating industry-defining websites built on leading technology including the government content management system, the Vision CMS™. Widely recognized as the government website experts, the company has earned hundreds of prestigious industry awards for its unique websites.